The defeat at Roots Hall, which had originally been scheduled for Easter Monday, but chosen for Sky, condemned the Blades to twelfth in the table, and more importantly open up a nine point gap between United and sixth spot - all but surely resulting in another season in League One. Dean Hammond netted for United, cancelling out Tyrone Barnett's opener in the first half. The second half saw Billy Sharp spur a glorious opportunity to take the lead before David Worrell fired the hosts ahead and, on the break, Jack Payne netted to seal the victory in front of the 7,004 crowd. Blades boss Nigel Adkins was forced into a change, with John Brayford picking up a calf injury in training, Ben Whiteman dropped into Right Wing-Back, whilst the three centre-halves remained unchanged. Forward Martyn Woolford returned from his bout of absence through injury to make up the substitutes bench. The game started off pretty even for both sides, with the two sides both chalking up shots on goal. Basham was booked after just three minutes for a foul, and from the resulting free-kick, Corker curled the set-piece straight at Long, whilst Deegan sliced over for the hosts. Sharp's half-volley was pushed round the post after he latched onto Done's quick throw, and Bentley, the Southend keeper was called into action again, keeping out Done's effort before preventing Flynn from side-footing home the re-bound. United looked like taking the lead on 27 minutes when Sharp's long range effort was thumbled by Bentley, but was able to quickly track back to goal and prevent the ball crossing the line. Within a minute the ball was in the back of the net, but at the wrong end. A free-kick swung in by Worrell saw Thompson's header stopped by Long but was unable to keep hold of the ball as BARNETT reacted quickest to stab the ball home. It was a goal which United did not deserve but composed themselves well, and with 34 minutes gone were back level. Thompson had fouled Adams on the edge of the box, Flynn looked shaped to shoot but crossed instead to the back post where HAMMOND was lying in wait, unmarked to head past Bentley. As the play drew ever close to the half-time whistle, chances became few and far between for United with Southend seeing much of the action in sight of goal. Done challenged well to prevent a McLaughlin shot at goal, whilst Barnett headed Worrall's cross wide. Southend continued to remain a threat at the opening of the second half, but it was United who were gifted the better chances. Long kept out Atkinson from range but 53 minutes, Adams charged past a couple of defenders, and after Hammond recycled, the former fired over the bar with the goal at his mercy. Soon afterwards, Sharp wasted his best opportunity of the night. Long's boot up field saw Sharp beat his marker, with Corker falling on his backside, Sharp attempted to lob but could only hit the roof of the net. It was a chance which would prove costly for United as the Shrimpers marched on to take the lead. WORRALL took control of Deegan's long pass, cutting inside Done and his powerful left-footed shot evaded all before nestling into the bottom corner of the net. Further chances to extend their lead went begging as Long stood firm, keeping out Deegan after failing to clear a corner, and also from Barnett's volley. At the other end, efforts from Whiteman and Adams threatened Southend's goal. Adkins threw on Calvert-Lewin and Sammon as United went for a three pronged attack. Adams curled his free-kick into the arms of Bentley and Calvert-Lewin hit a shot just over the bar as United continued to raid the home goal. A crazy last few minutes almost saw a United goal but Southend took advantage to finish the game off. A crazy last few minutes almost saw a Blades goal, Basham's header at the far post, following a corner bounced of the post and from there Southend were able to clear their lines, but the ball fell straight to PAYNE whop weaved past Done before his low chip flew over Long, and despite Flynn rushing back was unable to prevent a goal. Sharp fired narrowly wide in added on time before the referee put an end to the night's proceedings. Picture: Foul? 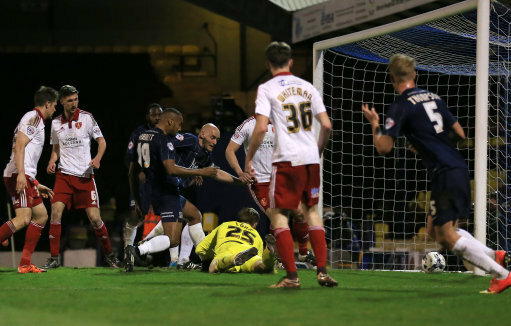 Southend United's Tyrone Barnett (no19) scores their first goal of the game. Southend United: Bentley, Coker, Thompson, Worrall (Leonard 84), Payne, Weston (McQueen 67), Atkinson, McLaughlin (White 77), Barnett, Deegan, Barrett. Unused: Smith, Hurst, Loza, Malarczyk. Sheffield United: Long, Basham, Flynn, Coutts (Woolford 88), Sharp, Done, McEveley, Adams, McGahey, Hammond (Calvert-Lewin 73), Whiteman (Sammon 84). Unused: Howard, Reed, Kelly, Brooks.